..so they dance! : I want to learn Tamil in 30 days or; Ek Duuje Ke Liye. I want to learn Tamil in 30 days or; Ek Duuje Ke Liye. I admit to prejudice; the more classic 80's films I watch, the less I think the decade as a barren wasteland of cinema. I mean certainly it was the time when the formula of the 70's was falling apart; the violence got gorier, the angry young men got meaner and the cheese went stale and turned moldy. But nevertheless, it had it's moments, as witnessed in Maine Pyar Kiya, a cute late 80's romance and in K. Balachander's Ek Duuje Ke Liye, from 1981. Of course, the film is a remake of the same director's Telugu film Maro Charithra (1978), also starring Kamal Hassan. I guess whenever the North runs out of ideas, it's easy to turn to the South, and I'm sure the Southie stars were happy to debut in Bollywood with such a fun little film. EDKL tells a story of inter-lingual love. Goan girl Sapna (Rati Agnihotri) whose family speaks Hindi, lives next door to a Brahmin Tamil family. Her mother often gets into arguments with the father of the Tamil family, over various neighborly issues. One afternoon Sapna runs into Vasu (Kamal Hassan), the other family's son, and despite the fact he doesn't understand Hindi, they fall in love. The families, as you can imagine, aren't happy with this but Vasu arranges a deal - if they can stay apart for one year and still remain devoted to their love, their parents will agree to their marriage. Instead of focusing too much on the hate between the families like many, many movies that came after Ek Duuje Ke Liye, the film keeps it light and romantic. The connection between Vasu and Sapna is youthful, they play silly games, and especially the scenes where they teach each other one another's languages are memorable. The chemistry between Rati Agnihotri and Kamal Hassan is dead-on and they are, to put it simply, adorable. Love blossoms between them despite the differences in language and they find many nonverbal ways to communicate and express that love. Then of course there are the actual language studies they partake in, as referred to in the title of the film. Tamil in 30 days sounds a little unattainable, but oddly enough I do have a tiny booklet called "Learn Tamil in a Month". I've owned the book for months and haven't learned Tamil yet, so there goes that promise. I'm really happy about this being only my second Kamal Hassan film. The other one was a Telugu film called Sagara Sangamam, where he plays a classical Bharatanatyam dancer, and it was also from the early 80's/late 70's. It's great to see him, not at an already established point in his career, but the classic early films he was in that made him the legend he is today. His Vasu is simply adorable, fun and carefree but not without depth - perfect romantic lead, in other words. I also realized while watching exactly how much others have learned from his acting; for example, his antics as a romantic hero can be seen reflected in Aamir Khan's romantic roles. 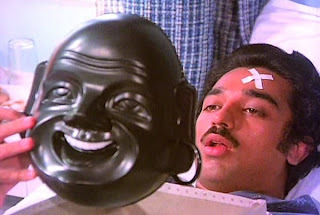 I'm not sure if Aamir has ever cited Kamal as an influence, but the similarities were there for me at least. The soundtrack is lovely, especially as picturizations; my biggest favourite of them is this one, where Vasu and Sapna sing a song composed entirely of Hindi film titles of the past, titled "Mera jeevan saathi". Brilliance! But the movie is not without flaws, the execution of the ending included. Don't get me wrong, as an ending I liked it; but the way the happenings were carried out, let's just say, could've been done so much better. Regardless, get your hands on this! It's a classic you won't want to miss out on. I didn't particularly care for this movie, or Maro Charithra, to be honest, although I own both of them. **soft laugh** I prefer Kamal's Tamil films, particularly the ones from the 70s and early 80s, like Sivappu Rojakkal, Guru, Meendum Kokila, Varumaiyin Niram Sivappu, Sattam En Kayil, and Oru Kaidhiyin Diary. I liked him best when he was paired with Sridevi, because I thought they had awesome chemistry. I don't think he's THE BEST actor in India, but he can be good, and I love to watch him dance. And on a shallow note, I thought he was beautiful in his youth, but hasn't really aged well, although he still has his moments. I'd love to see his films with Sridevi but I'm not devoted to enough to find those on DVD.. Do they have subtitles? He was very cute as a young actor but I agree, he hasn't aged well. I wonder why the 80's has such a terrible reputation? To me the early 90's are worse so far (although admittedly I haven't gotten *that* far). Kamal also did "Ek Nai Paheli" in the 80s, which, though not the best execution either, had a pretty interesting perspective. Nicki - Do get it again on DVD, it bears repeat watching, I'm sure. Reviewer - I'll keep that film title in mind. Ajnabi - I love 90's cheesy films!! 80's did undeniably contain a lot of crap..
EDKL worked for me on and off until it got to the ending. At which point it seemed to lose the plot completely. I can see why he did it, in a way: the year apart was over, and the two were still in love. They had worked their problems out, it seemed, and no dramatic tension remained. So he could either have a tame ending involving happy families, or have a duck fall out of the sky and hit them on the head. He went with the latter. Except, when it was over, the tragedy seemed gratuitous. Another good early Kamal movie to watch is Kalyanaraman, where he plays two roles (one being the village idiot). Surya's Perazhagan is inspired, at least in part, by that one. ps: How is college life treating you?